James Dunn, my great grandfather, was born in London, England, circa 1830, the son of Charles Dunn, a carpenter, and his wife Mary Ann (nee Rouse). His parents had been married at Stepney, Christ Church, Spital Fields on the 24th August 1823. James was christened on the 29th August 1830 at St Alphage, Greenwich Street, where his sister Susanna had been christened two years previously on the 17th February 1828. Elizabeth Bevan the daughter of Thomas Bevan and his wife Elizabeth. Elizabeth was born in Glamorganshire, Wales and had immigrated with her family to Australia. James Dunn and Elizabeth Bevan were married on 25th March 1861 at the Wesleyan Parsonage, West Maitland. 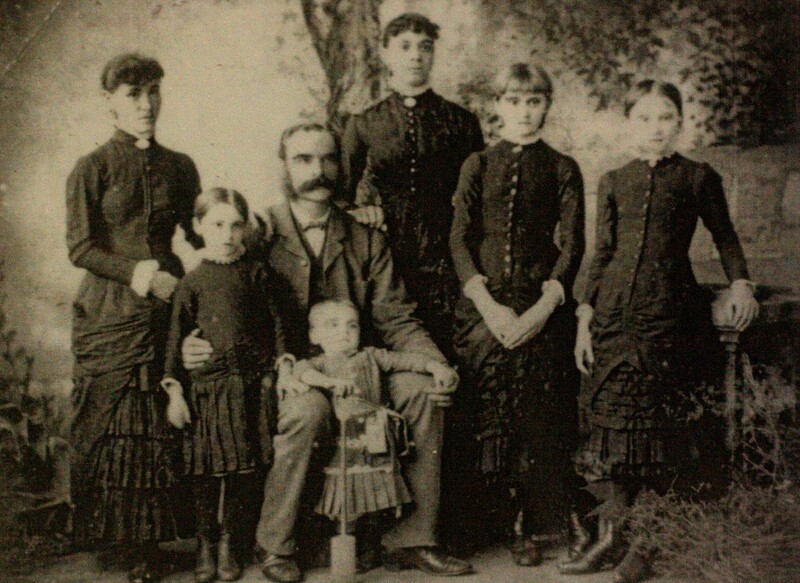 Their first child and eldest son William John was born at West Maitland in 1861. 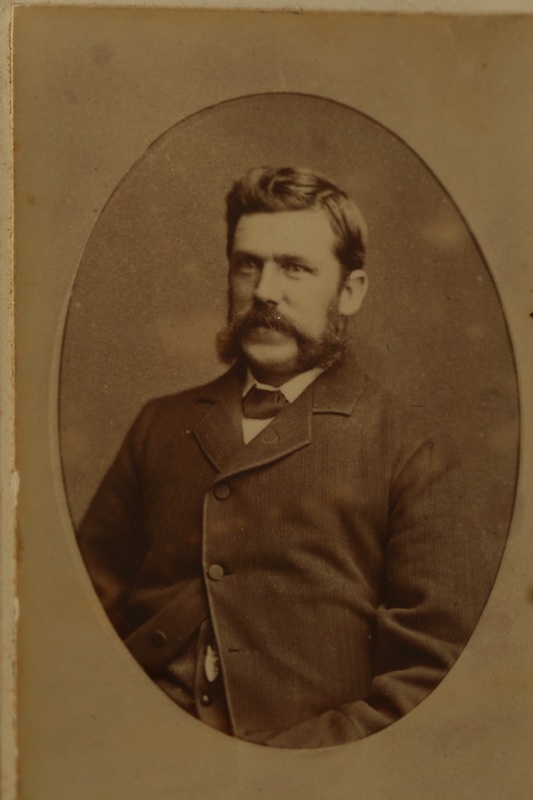 Soon after his birth the family moved to the St George area in Sydney where Thomas Charles was born in 1863 followed by Elizabeth A (1866), Susan (1868). By 1870 the family were living at Newtown Road, Newtown. Mary Jane was born at Newtown that year followed by John in (1873), Emma (1876) Ethel R (1878) and Alfred Henry in 1881. Sadly Alfred died in infancy and after his death the family moved to Missenden Road, Camperdown where Alick Ernest was born on 31st October 1884. 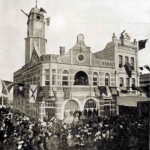 James owned and ran an Umbrella & Tobacconist Shop at 159 King Street, Newtown for many years. It was located this side of the Newtown Bridge. The umbrellas were handmade by James. He was a cutler by trade. James Dunn died of Chronic Brights Disease at Prince Alfred Hospital, Camperdown, on the 26th May 1889 aged 59 years. James was buried in the Church of England Section of Rookwood Cemetery. His wife Elizabeth died in 1891 at Paddington and was buried beside her husband at Rookwood. Alick Ernest ‘Ernie’ Dunn, my grandfather, was born on the 31st October 1884 at Missenden Road, Camperdown. He was the last of ten children born to James Dunn and his wife Elizabeth. He was always known as Ernie. Ernie was only four years of age when his father died and he lost his mother two years later. It is presumed that his sisters then took care of him. Not much is known of his early life but we do know that he was at times a labourer, greengrocer and nightwatchman. Ernie married Christina Gibson Munro at St Enochs Presbyterian Church, Newtown on the 3rd December 1910. Christina was born at Aberdeen NSW the daughter of William Munro and his wife Christina Gibson. The family was living in rented rooms on the second floor of a terrace house at 36 John Street Erskineville. It was here that their first child, Alic Ernest, was born on the 1st December 1911. They lived in this little room until 1916 when they moved to 16 Fitzroy Street, Newtown. In September 1914 War was declared and Ernie tried enlisting in the Australian Imperial Force. He was rejected twice due to the fact that he had a problem with his right knee. But his persistence was rewarded on the 23rd August 1916 when he was signed up at the Royal Agricultural Show Grounds at Moore Park at a recruitment rally. He stated that he was a greengrocer by trade and was aged 31 years and 10 months. He joined the 23rd Battalion as a private. He undertook army training at Dubbo from the 3rd September until 19th September and then joined the 19th Reinforcements at Liverpool. He was promoted to Lance Corporal on 21st October 1916, the same day he embarked at Sydney for England on board the Arygyleshire arriving in Plymouth on 10th January 1917. During the trip he was injured and admitted to hospital. On arrival in England he was transferred to the 6th Training Battalion at Larkhill where he was injured once again. He invalided home to Australia on the 14th May 1917 due to synovitis of the right knee and a displaced cartilage. He was discharged from the service the following year on the 18th August 1917. 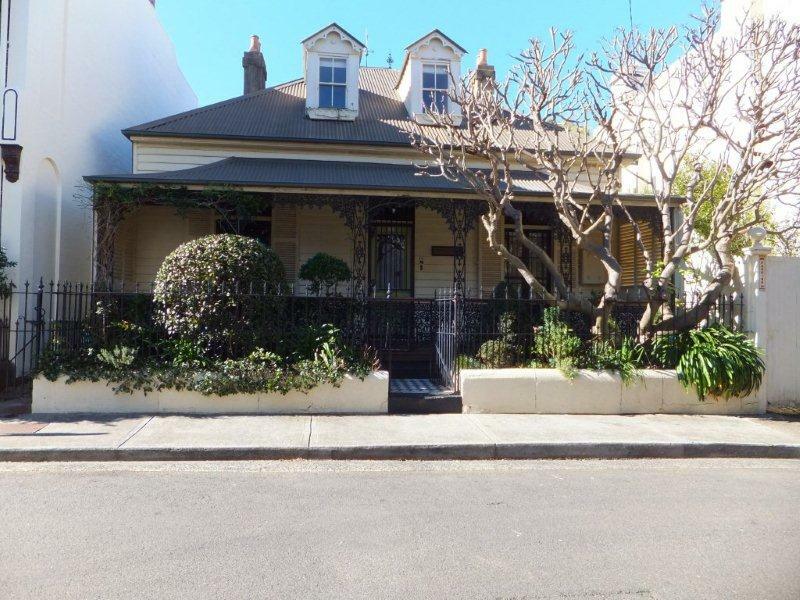 The family moved to 25 Grove Street, St. Peters (Petersham) in 1925. Ernie had purchased the property known as Lot 5 Section 4 of the Maryville Estate from Edwin Knight of Newtown in February of that year. The land on which the cottage had been erected was at one time part of the 470 acres granted to Thomas Smyth on 8th October 1799. The property then passed to Thomas Chalder who lived at St Peters from 1849 at Heathcote House, set on a 9-acre site. Chalder is remembered because he was responsible for naming the suburb of Marrickville. 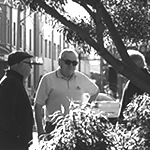 Apart from living for a short period of time in Chapel Street Marrickville, the Chalders lived in St Peters and had a close involvement with St Peters Church. From the 1850s Chalder speculated in property in Marrickville, St Peters and Cooks River (Tempe) and anywhere he saw a bargain. Chalder sold this property to Thomas Dean on the 1st January 1865. Thomas Dean died on the 17th October 1910 and the property passed by devise to Charles William Dean. The property remained in the Dean family until January 1912 when it was sold to Edwin James Knight. The property was located on the north side of Grove Street and known as Lot 5 Section 4 in the Maryville Estate and measured 50ft x 100ft. It contained a double fronted brick cottage with an iron roof, of three rooms, kitchen and offices with a detached wooden laundry. My father, Alic Ernest Dunn, was born in a rented room on the second floor of terrace house at 36 John Street, Erskineville, on the 1st December 1911. His father Alick Ernest Ernie a labourer and his mother Christina Gibson Munro had been married the previous year at St Enochs Presbyterian Church at Newtown on 3rd December 1910. My father was their first child and eldest son and was christened at St Enochs. He began his school life at Tempe Public School and when the family moved to 16 Fitzroy Street, Newtown, around 1916, he attended Bligh Street School. He doesnt remember his father being around much. He used to visit his Munro relations often with his mother. They would always catch a tram. At the end of each visit his mother would be drunk and he would have to see her home. The tram driver got to know them and would stop and help her onto the tram. While still attending Tempe Public School he helped out at Phillips Produce Store, on the corner of Grove Street and the Princes Highway at St Peters. He was just a roust-a-bout. The produce store sold all kinds of feeds etc. in bulk, he did not receive any wages while he was there, it was just something for him to do. His Uncle Jack Dunn was a very good athlete. He used to watch him race nearly every Saturday afternoon at Newtown. Jack would arrive at the start of the race with his Knife Sharpening Barrow, which he would leave with Dad while he ran. Jack ran with the Hash Harriers and won most of the races he contested. After the race he would pick up the barrow and continue on his way around the streets of Newtown. The family moved to 25 Grove Street, St Peters in 1925 and it was around this time that he that he left school. 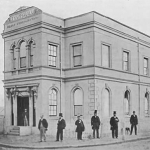 His first paid job was the Ceruti Spillstead & Company, which at that time was located at 14 Mary Street, St Peters. He was paid about 30 shillings per week. He was only 14 or 15 years of age and at first he just did odd jobs around the factory and was later taught woodturning. He attended Ultimo Technical School in his own time and at his own expense. He was apprenticed but not indentured and was employed by this firm for about 9 years. In the factory all employees worked 5 days a week from 7.30am till 4pm. Every afternoon after knock off time he was expected to stay back and clean down the benches and shovel all the wood shavings into large wool packs that were hung along the walls in the factory. All employees were expected to stay back no one was paid for the time spent cleaning or for the time spent in the mornings when the machines had to be greased before starting time. My father was taught all facets of the wood turning trade and eventually could use every machine in the factory. He used to do what they called piece work which was very illegal at the time. The wood would be cut to size and he would be paid 10d per dozen for the handles he turned into shape. The factory made all sorts of handles from broom handles, nailbrushes, scrubbing brushes, paint brush handles etc. There was no workers compensation, as we know today, if you were hurt on the job you received 1/3d per day. My father ripped the palm of his hand open on the shaping machine, while shaping nailbrushes. The brushes were fluted down both sides and the accident happened while he was putting the wood through the machine. He couldnt live on the meagre compensation so he resumed his duties again before the cut was healed. The factory, was very hard work, and even though you were told that you would receive 10d per dozen for the handles you were making, when the time came to be paid you might only get 9d per dozen. You had to accept the conditions, as there was always someone else to take your job. You were also expected to supply all your own tools. There were about three big fires in the factory while my father was employed there. Each time all the employees lost their tools and still were expected to have them again when the factory re-opened. There was no compensation for loss of tools and that was that. The last fire at the factory, my father knew was going to happen. The big storeroom where all the orders were kept was overflowing with all sorts of handles. Trucks arrived and loaded up all the stock and took it away so that Friday night before leaving for the weekend, my father collected all his tools together and took them home with him. Sure enough over the weekend there was a fire at the factory and it was reported that 80,000 work of stock was lost. Eventually Spillstead left the partnership and Ceruti started the factory up on his own. My father was then earning 3 per week. Work was very slow in the factory and he would be stood down when work was quiet and then he would be asked back to make up a sample order. 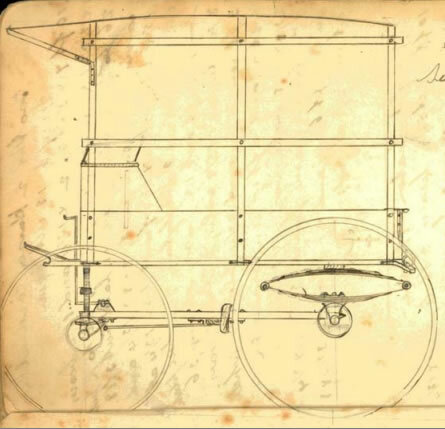 He would travel to the factory which was about hour from his home at 25 Grove Street, St Peters, and spend about an hour or so making up the samples, clean up, then go back home. He wouldnt get paid for the time spent on making the samples but would be promised the order when it came in. Sometimes he would make 20-30 gross of chisel handles or 100 gross of paintbrush handles, and remembers well the three months spent making breadboards. The work would quieten down again and he would work a few days and then have a few days off. It was on one of these days off that he went to the Poultry Markets at Ultimo and bought a mixed batch of day old chicks and took them home to Grove Street. He made coops for them and in to time at all he was selling fresh eggs and dressed poultry on his days off from the factory. He was selling 12-14 chooks a week and had a few regular customers on his run, and it was a good little business. The work at Cerutis did not get any better and some of the work he had been promised was given to someone else and the factory was relocated opposite the Drug House at Tempe. He was still having more days off than working and his little sideline with the chooks was paying regularly so he took his tools home with him and quit. He had been home about 3-4 weeks when another chap joined Ceruti in partnership and came to see my father and offered him his job back with the promise that he would be guaranteed work. But, my father could see the writing on the wall and thanked him for his offer but declined. He had built up a good business of his days off and would rather concentrate on building that up. While my father was still working and looking after his chooks my grandfather Ernie bought home flying pigeons. My father of course used to look after them. There was about 100 at a time. He attended the Sydenham Pigeon Club meetings held on Saturday nights. He would cull the pigeons and sell the squabs (baby pigeons all plump and no feathers) for 5/- each. He always had buyers for them. The business was doing so well that they ran out of space in Grove Street and he and his father started looking around for a larger area of land. 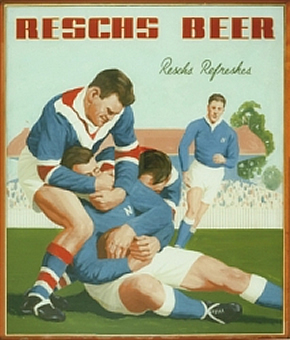 They eventually settled on a three, half-acre blocks at Revesby in the early 1930s. The land was originally a rather big estate, sub-divided into blocks. The owners lived in a house with a very high tower in Tower Street, Panania. The view from the tower was glorious. It took in all the surroundings. The 13 lots purchased by Ernie for £300 began from the top of Beaconsfield Street to half way down Sherwood Street. Three of the lots only had a 100ft depth but the other 10 lots had a 200ft depth and went through to Albert Street. Sherwood Street at that time was just a dirt track winding its way through the trees and bounded by a post and wire fence. The fenced was barbed wire to keep the stock in. The only houses in the street then were situated on the western side; one was a stone brick house, the other, a black brick house. There was a Railway Station and a Real Estate office located near the railway. To travel along Sherwood Street to the Railway you had to circumnavigate the bog hole at the corner of Sherwood and Bransgrove Road, as there was a creek running through the land and it didnt matter whether it was wet or dry, it was still a bog. Revesby Public School was already built as well as the Congregational Church. Opposite the school was a corner general store and post office agency. If you had a telegram delivered to your home it would cost 6d. for delivery but many a time when a telegram was delivered to 87 Sherwood Street the telegram boy only received 2d and half a dozen eggs. In Beaconsfield Street Baileys built a little shop. The shop is still there even though different owners have been in it over the years and in 1987 old Mrs Bailey still lives in the house next door. Sherwood Street had electricity and the water came from Beaconsfield Street. A beautiful home was built at 87 Sherwood Street and when the home was finished it was the envy of all for it was a very modern house. The builder was a travelling builder who worked on the Queensland Cane fields in the sugar season and then would work in the building trade for the next part of the year. This man had two sons who worked with him and he offered to take my father with him for a season but my father declined his offer. As soon as the home was finished Mrs Carter, the housekeeper and her daughter, Marie, and son, Ron, Ernie and Ray moved in. The home is still standing and owned by Mr and Mrs De Lap in 1987. Even though they have added and taken away from the original dwelling over the years it is still a lovely home. It was one of the first homes to have a two-way light switch to turn on the front lights from the rear of the house. It had beautiful polished floors and a front verandah. Sherwood Street was on the bus route and the buses used to run every two hours into Bankstown and the six oclock bus was the picture show bus that would drop you outside the Jewel Theatre. The cost of the bus trip was 3d and 1/- to go to the movies. The buses would not do a return trip until after the pictures were out so if you were unlucky enough to miss the bus home you would have to wait until the movies had finished for a ride home. Many a time my father fell asleep on the last bus. His mother had left by this time; his father and mother had been divorced in 1929. She was an alcoholic and was always in and out of drying wards of a hospital. She would be away about three times a year. It was at this time that my father would be able to buy another set of clothes for himself. When his mother was home he would have to wear all his clothes to work because if he didnt his mother would hock them for grog. When they moved into Sherwood Street they sold all the livestock and built fowl pens and purchased a stock of chickens from Doves Poultry Farm on Doyle Road. They would buy day old chicks, raise them, and sell them at the markets. They ventured out and bought a few ducks and a drake and then began selling ducks as well. My father would take the poultry to market in crates in an old Buick car that he had made into a Ute. He had to grubb some of the land to grow the green feed. He bought an old plough that had been run over and bent, for 10/-. He took it to pieces and straightened it out by making a fire in the open, close to where he was working, and used the fire as his forge. Ernie then purchased an old mare, about 40 years old at the time, then bought a collar and they only had rope traces. A bit of 3 x 2 hardwood was used for the swing bar and a bit of fencing wire was then attached to the plough. The fencing wire was used because if you happened to hit a stump the wire would let go and the horse would not fall to its knees, only my father would go over the top of the plough. This was the way my father dug the ground. Some stumps were too hard and too big to move, so he would light a fire with all the little stumps and burn the stump out. After ploughing he would plant wheat, barley, lucerne; feed for the animals. Then Mrs Carter insisted that a cow be bought and so Ernie purchased an old cow for 4/-. Mary was a good milker but gone in the brain. They used to separate their own milk, but as Dad was the only one who could clean the separator and put it back together again without any parts left over, he had to do that chore as well. Ernie loved dogs and so the little property had more dogs than the RSPCA pound. It would take my father an hour to feed them all. Then a vegetable patch was started for their own use, but beans were bring a good prices so Dad took them to the markets and sold them. They had bought a couple of pigs and opened up more land and started a market garden in addition to the poultry business. The Auctioneer at Flemington Markets would be rung and told that they would be coming to the markets the next day, and by the time they had arrived, everything they had to sell would have been sold. It was of such a high quality that there was no hassle over the money side of things. Soon the old mare was just too old and Old Darkey was bought. Old Darkey used to be a lead horse in a plough team. The only time my Dad was hurt by him was when he was first brought home and my Dad wasnt used to his ways. After Darkey finished work for the day the harness would be taken off him and he would be hit on the rump and then he would kick his heels high in the air and take off. Dad did not know this would happen and was standing behind Darkey when his kicked out and Dad was flattened. My father loved this horse. He would put him in the harness and tell him if he wanted him in the farrow or out of it and Darkey would do what he was told. He used turn around at the end of each row by himself and line himself up for the next row and would take off even before Dad had time to get the plough around. Many a time my father was exhausted trying to keep up. Old Darkey worked right up to the time they bought the rotary hoe and even then would carry the cart with the manure for Dad to spread over the ground. While Dad was away in the Army, Darkey had to be put down. The old mare was sold for 1/- to a chap who owned the Gladioli Farm in Doyle Road at Revesby. The owner thought she was great as she was very slow and just what he needed for in between the rows of Glads. She was only there a couple of months when she dropped dead in the paddock. In the meantime Dad got a part-time job driving buses. He would start at 5am and drive into Bankstown and pick up relief workers (unemployed) and take them to different camps around the area; Milperra, Georges Hall or Salt Pan. They were employed in quarry work or excavating. In those days times were hard and when you were paid the dole you had to work for it. Dad thinks 1 week in 3. The Government paid all the fares and Dad remembered he would have to drive rather slowly to work just to make sure the workers were at their destination before the 7am whistle blew. He would then drop the bus back at the depot and return home to the farm work. He would then go back at 2pm and pick up the bus from the depot and be out at the camp for finishing time but he had to break all sorts of speeding records on the way back to Bankstown. He would then go home to finish his chores and many night the hurricane lamp would be lit so he could cut the green feed for the morning. He was paid 2/6d per day for his bus driving. It was while he had this part-time job that they purchased the rotary hoe. A second hand one at that. War was then declared and one day while ploughing in the paddock he just downed the rotary hoe and walked off the farm and enlisted in the army. Due to a back injury Dad spent some time in Greenslopes Military Hospital in Queensland. He had an operation and during his rehabilitation was taught a wide variety of skills. Leatherwork was very popular with the men. Dad was taught to make a variety of leather bags. Aeroplanes at that time were built with perspex windows and out of the scraps Dad learnt to make brooches. Some soldiers made rings. He made three brooches in all: a blue butterfly, a flower and a kookaburra. The kookaburra is now in my possession. 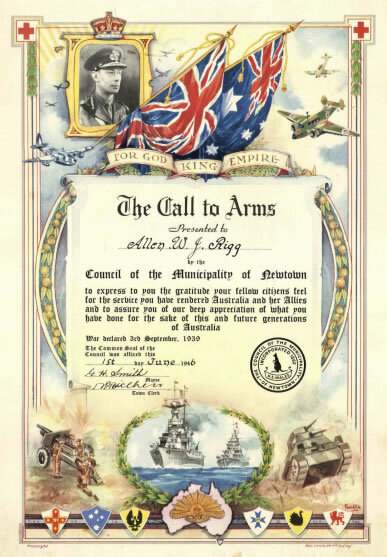 He was discharged from the 2nd AIF at Sydney on 28th February 1946. This information was found on the IGI. Official documents record his birthplace as Kent, England.